Whether you’re thinking of applying for work experience, an entry-level job or a school leaver training programme, chances are you’ll need to put together a CV. This is a standard part of the application process and helps to give employers a clear idea of whether your written communication skills are up to scratch. Your CV needs to be easy to read and understand; it should cover all the necessary information and shouldn’t include any howlers, such as spelling mistakes, that will put the recruiter off. There is no one right way to put together a CV. There are some standard headings that you will find useful and there are some common errors you need to avoid. However, you can adapt the format to suit you and reflect your strengths. A CV is a personal document and everybody’s CV is different. You should also update your CV for each job application and adapt it to show you have the qualities and qualifications the employer is looking for. Our example CV will give you ideas and help you get started. It has notes on the level of detail you need to include, how your CV might evolve over time, and some optional extras. Personal details and contact information – this is essential. Education – again, essential. Our CV uses ‘Education and qualifications’ as a heading. If you have done a relevant training course you could highlight this by using ‘Training’ as a separate heading. Employment history and work experience – another must-have. You could present this as two separate sections. Voluntary work. You could give this its own separate heading, create a ‘Work experience and voluntary work’ section, or give details of your voluntary work in your 'Interests' section. Skills. When you are describing your work experience and voluntary activities, look for ways to highlight skills such as communication and teamworking. If you have specific relevant skills you can draw attention to them by putting them in a section of their own. Strengths and achievements. You could give these a section of their own, or cover them in the other sections. Most importantly of all, don’t lie. If you’re found out you could lose your job and, even worse, in some cases you might be liable for criminal prosecution. Don’t waffle. 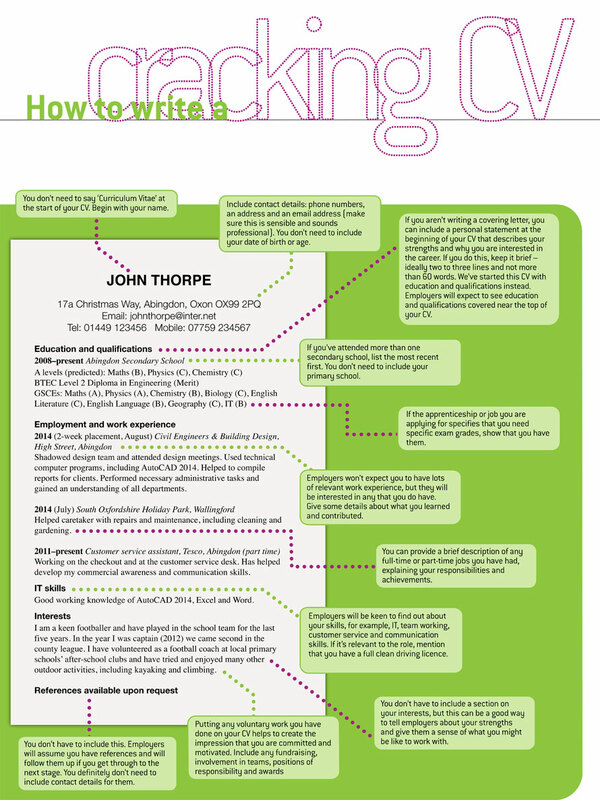 Your CV should be no longer than two pages and at this stage it’s more likely to be one page, as in our example. You can use bullet points and you don’t have to use full sentences. Don’t be too fancy or too informal. Describe what you can do in a direct, confident way. Use a professional-looking font such as Times New Roman, Arial, Verdana and Cambria. Check your spelling and grammar and get somebody you trust to read your CV and check it again. Employers spend 30 seconds on average scanning a CV, so make sure you don’t give them any reasons to reject you.